The LORD saw how great the wickedness of the human race had become on the earth, and that every inclination of the thoughts of the human heart was only evil all the time. The LORD regretted that he had made human beings on the earth, and his heart was deeply troubled. So the LORD said, “I will wipe from the face of the earth the human race I have created—and with them the animals, the birds and the creatures that move along the ground—for I regret that I have made them.” But Noah found favor in the eyes of the LORD.. 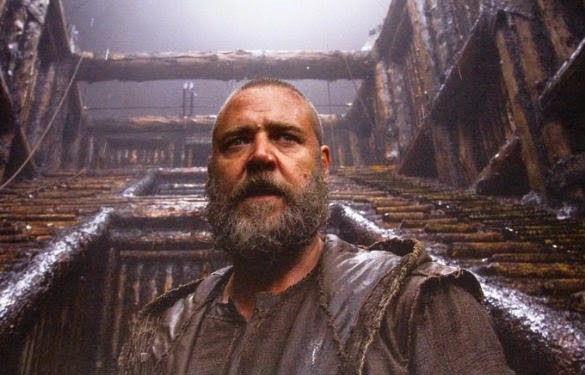 I haven’t seen the new movie Noah yet. I’ve read the book, though, and I know how it ends. It’s sort of like Titanic that way, you know? Well, except the ark doesn’t sink. But you know what I mean. I haven’t seen it, but lots of people apparently have. The movie’s generated a lot of buzz, a lot of discussion. It even led some students in Leicester to research whether or not the ark could have held the necessary number of animals and still float. (Their verdict? Yes. Though, to be a little picky, they didn’t seem to take into account that Noah took seven pairs of clean animals.) It’s getting moderate reviews. Some Christians (and Jews and Muslims) really seem to dislike the movie on the grounds of biblical accuracy. (When did Hollywood ever adapt a book faithfully? Three films out of The Hobbit? Give me a break.) Others point to statistics that show a large spike in the number of people reading the Bible’s account of the flood as evidence that at least the film has driven interest in Bible reading. Like I said, I haven’t seen it. I’ve read some reviews, though, and some reflections by Christian, Jewish, and Muslim writers on the film. Sounds to me like it’s a pretty entertaining movie, as long as you don’t expect it to be the biblical story of Noah. In a strange sort of way, the biblical story of Noah (in contrast to the film) is really about God’s grace and mercy. That’s a point that’s easy to lose, even in the biblical story, because we’re told in the Bible that Noah was saved because he was righteous and faithful. Of course, God was under no obligation to save even a righteous, faithful guy like him. The animals that didn’t get on the ark did nothing wrong, and yet God wiped them out. The Bible isn’t clear as to why the animals are wiped out, in fact, but it probably has to do with the fact that people were created to mind and care for God’s creation. When people became so inclined toward evil that they couldn’t care for Creation as God had intended, it all went south. God’s creation was “good,” but it was seamless. When one part went bad, the whole cloth was ruined. The movie, apparently, operates on the assumption that nature is good and people are bad. I suspect a zebra being chased by a lion might have a slightly different take on that, if he could tell you. The biblical flood story assumes a creation that is woven so tightly together that to remove one part is to destroy it all. Noah in the movie is apparently not even sure that he and his family are supposed to survive, and contemplates killing his grandchildren when they are born. But the Bible is clear that saving the human race is the point of having Noah build the ark. But the biblical flood story tells us that God didn’t give up on his creation. He preserves Noah and his family on the ark, not because Noah was perfect, but because he was a man with whom God could reboot. Sure, God could have simply repeated the Creation. That’s exactly what a God with no compassion for what he’d created would do, exactly what a God with no attachment would do. But that’s not the God of the Bible. The God of the Bible has compassion for what he’s made. He shows mercy, and that mercy takes the form of ark blueprints. That may not be the kind of mercy that we have a taste for, but when it started raining I bet it sounded pretty appetizing to Noah. According to reviews, the movie’s more like some of the ancient near east flood stories, in which a hero saves himself, and so the human race, from the capricious gods who want to cleanse the earth of the nasty little creatures. The biblical story, on the other hand, emphasizes that God’s mercy is the catalyst for the whole series of events. Absent his mercy, he might have left the world to tear itself apart. But by adding grace to the mix, God literally brings about a new world. It must have been horrendous, painful, and catastrophic. It was the end of the world, after all. But it made something new and better possible. When God offers grace, that’s what happens. Corruption, wickedness, violence, and selfishness convulse. The heavens split open, and the fountains of the deep burst forth. Some of the old order is swept away by the deluge, to be sure. But in the wet soil of the old lie seeds of hope for the new. The New Testament doesn’t give a lot of space to the story of Noah. But one of the New Testament writers who does mention the flood, Peter, puts that spin on the story. It’s a story of God’s patience, he points out, God’s refusal to give up while hope still remains, even on those who are disobedient. It’s a story of God’s salvation, a story of new life, a story of resurrection. It’s a story, in short, that reminds us of the story. It reminds us, as many stories of new life do, of the gospel of Jesus, the good news that through his resurrection a world enslaved to sin and death is liberated, renewed, and redeemed. The God who told Noah to build the ark is the God who sent his Son to die for the sins of the world, with the same outcome in mind in both cases: salvation. May we who have received that salvation never fail to show the mercy and compassion we have received in our treatment of the people around us and the world he has given us. Even to people who make inaccurate movies about Bible stories. "If You Had Been Here...."